2013 has come to a close, and boy, was it an incredible year for Tap Cancer Out. If 2012 was the year of firsts—Our first tournament and our first major gift to our beneficiary—then 2013 was the year of twos: Two tournaments; Donations to two chapters of the Leukemia & Lymphoma Society; and a gift totaling more than double the previous year’s total. Our flagship tournament, the Tap Cancer Out Spring BJJ Open, kicked off the year with a bang. 74 competitors set up fundraising pages motivating 926 donors to raise more than $37,500. On April 13th, 200+ competitors from dozens of schools around the tri-state area took part in the tournament, which ultimately raised over $41,000. Only a few months later we made our first trip out of Connecticut, taking the Tap Cancer Out BJJ Open to Danvers, MA on the tremendous St. John’s Prep campus. 200 more competitors joined us, including 55 fundraisers whose 339 donors raised another $12,000 for the Leukemia & Lymphoma Society. The fundraising didn’t stop there. In an act of pure selflessness, Tap Cancer Out supporters in the St. Louis, MO area who couldn’t attend our tournaments in the northeast, took it into their own hands to put together an event on behalf of our nonprofit. Sponsored by BJJ Legends Magazine, the Black Friday Grapplethon, which included a full day of grappling, seminars and giveaways, raised over $6,000 for Tap Cancer Out. This was far and away the most successful volunteer-run event in our nonprofit’s short history. But more importantly, Matt and the Black Friday Grapplethon has created a blueprint for other volunteers to host their own events to support our cause. 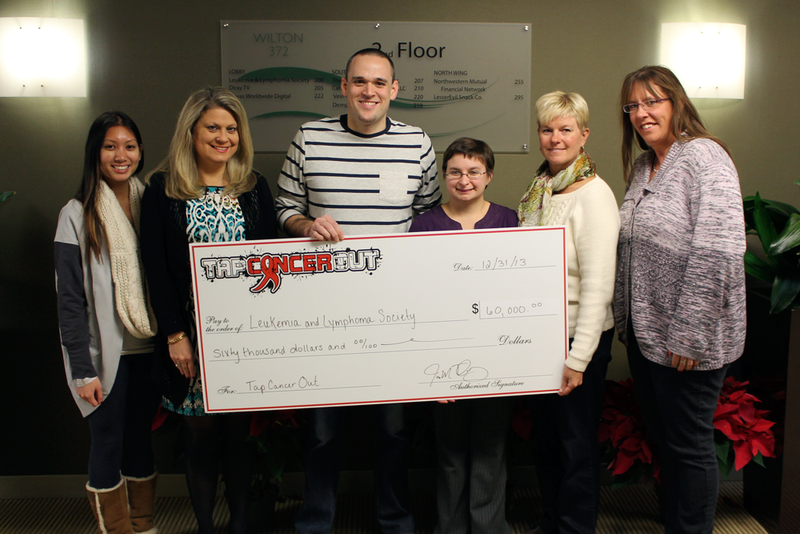 All of this allowed us to present the Leukemia and Lymphoma Society with our largest gift ever: a $60,000 check—$45,000 of which was given to the Connecticut chapter and $15,000 to the Massachusetts chapter. We couldn’t do any of this without our amazing sponsors. Inverted Gear was not only the premier sponsor for our two tournaments, providing the top fundraisers with a Gi of their choice, but also collaborated with us to produce our first Gi for sale at our store! RollMore.com (from the good folks at BJJHQ) launched this year and donated 10% of their first week’s sales, which resulted in a generous donation of $1,012. RichO’s Photography shot our Danvers tournament brilliantly. Fight Soap joined us at both tournaments, donating ALL their sales from the day. Mass Printing has produced all our shirts and stickers and Manto both designed and produced our awesome new rashguards. It truly was a monumental year for our small nonprofit. With the Brazilian Jiu-Jitsu community fully behind us, we can’t wait to see what 2014 has in store for us.